SABER Grills are designed and engineered to provide you a new level of cooking performance. There is nothing you can't cook on a SABER grill! All SABER grills cook with infrared heat locking the natural juices and moisture into your food. Our patented cooking system vents convective air, which dries your food out, away from the cooking surface. Flare-ups are eliminated and foods cook more quickly and efficiently. SABER grills heat from 0 to 700F in 10 minutes or less and our patented Infrared Cooking System allows for a wide range of temperatures. Easier and faster Assembly: Streamlined assembly steps using a single common fastener and more factory pre-assembly means you will be grilling sooner with a SABER grill. 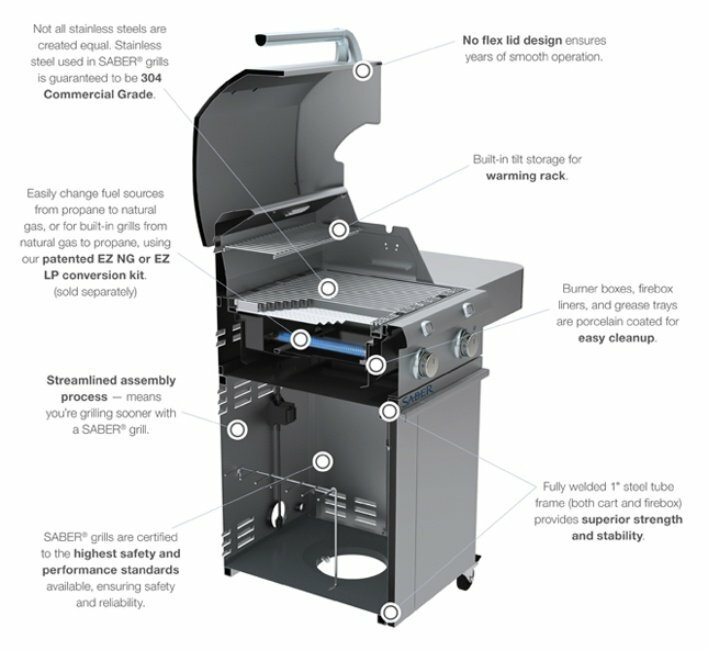 Every SABER grill has an electronic ignition point at EVERY burner plus a redundant "carry-over" ignition system that ensures a reliable and safe start every time you grill. Better for the environment: BTU's have nothing to do with cooking performance, but everything to do with how often you refill your propane tank or the size of your gas bill. You can now cook faster with fewer BTU's, reducing your gas consumption by 30%, which makes it good for both your wallet and the environment. It's the reason every grill we sell has the best cooking system available at its core, an engine to drive better cookouts. Because at the end of the day, you grill for one reason. For the Love of Food.